Impressa® and get answers to common questions. Sure it looks like a tampon, but it's not. 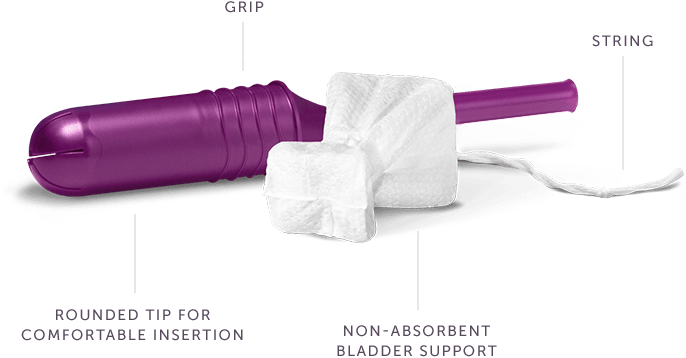 Poise® Impressa® Bladder Supports feature a custom Soft-Flex* core that is designed for comfortable removal, and to move with your body for a more comfortable fit. Poise® Impressa® Bladder Supports come in three sizes for a more personalized, comfortable and effective fit. Poise® Impressa® Bladder Supports are inserted and removed the same way as a tampon, and let you enjoy life without pads. But Impressa® doesn’t absorb leaks – it helps stop leaks before they start. Not all leaks are created equal. Is Impressa® right for you? Choose the statement below that best describes your leaks. Posie® Impressa® Bladder Supports are for you! This is called stress urinary incontinence (SUI). Impressa® Bladder Supports are NOT for you! This is called urge urinary incontinence (UUI).